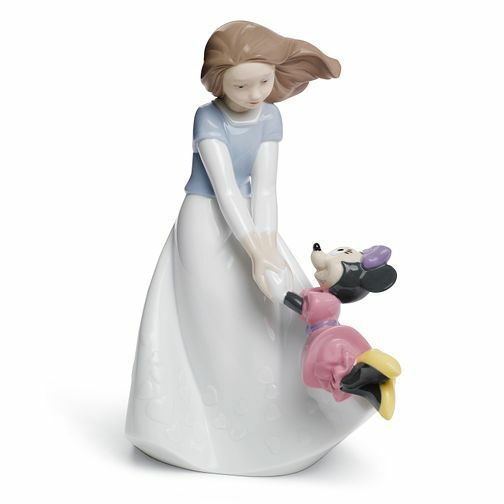 This delightful Nao Friends With Minnie porcelain figurine depicts a young girl in an elegant white and blue dress playfully swinging Disney's much loved character Minnie The Mouse. Handcrafted by skilled artisans in the famous Lladro workshops of Spain, Nao figurines have an individual charm and would make a wonderful gift for any Disney fan. Nao Porcelain Friends With Minnie Figurine is rated 5.0 out of 5 by 2. Rated 5 out of 5 by Anonymous from Excellent quality Beautiful ornament, would recommend. Really good value for money.